I've had so many comments and questions about the oatmeal pictured in my last entry, that I decided to go ahead and dedicate a quick post to it. Many of you may not have been reading a few months ago when Bella Eats was more of a food diary than a space for sharing recipes. I posted so many pictures of this breakfast during those first few food diary months that I'm surprised people didn't stop reading out of sheer boredom! To those of you who have been reading for awhile, I'm sorry if this post looks familiar. This oatmeal is one of my favorite daily breakfasts, so quick to make before work and hardy enough to keep me satisfied until lunch time. I was introduced to stove-top oats through the blog world - prior to reading Kath's and Heather's sites I was a pre-packaged instant oats kind of girl. Not any more. Stove-top oats are far superior in texture and flavor, and if you get old-fashioned rolled oats they only take 10 minutes to make. They are worth the extra few minutes, I promise. Adding mashed banana to my oatmeal was something I learned from Kath, and I’ve never gone back. I love the creaminess the banana gives the oats and never skip this step even if the toppings change. 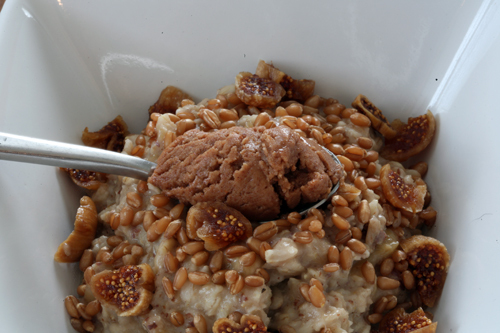 Wheatberries are another Kath-inspired addition - I love their chewy texture. When I’m eating oatmeal often (nearly every day during the cold months) I’ll make a pot full of wheatberries to use all week. You buy them dried, in the bulk foods section, and boil them in water for about 20 minutes, depending on the texture you’re going for. I like mine a little chewy, so 20 minutes is all it takes. Drain them and store them in an airtight container in the fridge for 7-10 days. And the figs - oh the figs - they are the best part. Their tiny little seeds and sweet flavor add so much to each bite. Love. I've tried many different variations of mix-ins, from fresh fruit to chocolate chips to canned pumpkin, but I always come back to this combo. 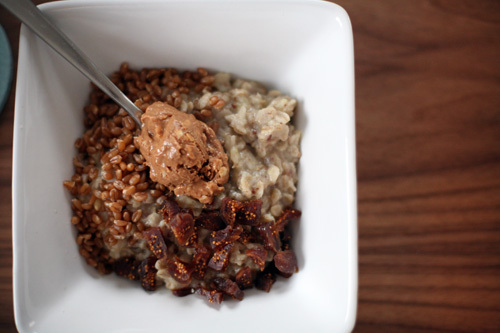 What are your favorite oatmeal toppings? Bring 1 cup of water to a boil. Add pinch of salt and 1/2 cup of rolled oats. Bring to a boil, reduce heat to medium and simmer, stirring occasionally. When the oats have absorbed most of the water, after 5-7 minutes, turn off the heat. Add the mashed banana and splash of soy milk. Stir. Add the flax seeds and cinnamon, stir. 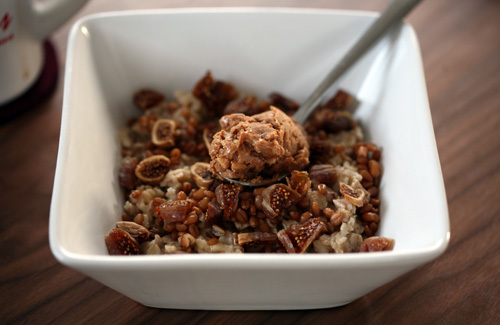 Pour oats into bowl and top with chopped figs, wheatberries and almond butter. Stir everything up so that the almond butter swirls through the whole mix. Enjoy, and if you choose, comment after each bite about how delicious the texture is. I do every time. For those of you who have stuck around since the early food diary days - Thank You! - I appreciate each and every one of you and love seeing comments pop up from familiar names as well as new readers.